In this blog let's talk about a really cool tool for MVC developers ‘Route Debugger’. Sometimes a bug in your route can break application because it invokes either an incorrect controller or action. So, do not worry just install this tool in the application and it will make your route debugging easier like never before. 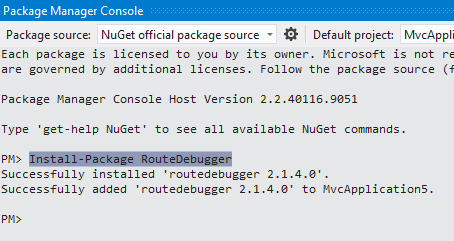 To install this tool, just open Package manage console and type ‘Install-Package RouteDebugger’ and you done. Once you installed, look at the screenshot and see how it works. If you do not want Route Debugger, you can turn it off from Web.config.